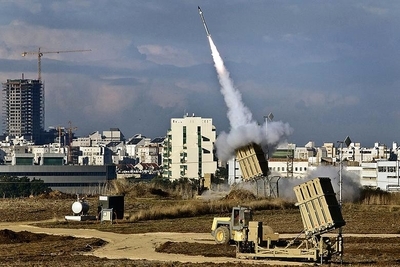 Missile shield: The superb performance of Iron Dome, the protective system that shot down nearly every Hamas rocket threatening life or property, has major military implications for Israel and the world. Its success signals that "Star Wars" (as opponents maliciously dubbed it upon introduction in 1983) can indeed provide protection from short-range and also presumably from long-range rockets and missiles, potentially changing the future of warfare. Iron Dome in action, protecting Israelis. Tunnels: Tunneling behind enemy lines is hardly a new tactic; historically, it has had success, such as the 1917 Battle of Messines, when British mines killed 10,000 German soldiers. The Israel Defense Forces (IDF) knew of Hamas' tunnels before hostilities began on July 8 but failed to appreciate their numbers, length, depth, quality of construction, and electronic sophistication. Jerusalem quickly realized, as the Times of Israel wrote, that "Israel's air, sea and land supremacy is not mirrored underground." The IDF thus requires additional time to achieve subterranean dominance. Consensus in Israel: Hamas' unrelenting barbarism created a rare consensus among Jewish Israelis in favor of victory. This near unanimity both strengthens the government's hand in dealing with outside powers (Prime Minister Netanyahu admonished the U.S. administration never again to second-guess him) and is likely to move Israeli domestic politics decisively to the right into the nationalist camp. Middle Eastern response: With the exception of Hamas' state patrons (Turkey, Qatar, Iran), the Islamist terrorists found almost no governmental support in the region. In one striking example, Saudi king Abdullah said of Hamas killing Gazans, "It is shameful and disgraceful that these terrorists are [mutilating the bodies of innocents and proudly publicizing their actions] in the name of religion." How well he knows his mortal enemy. 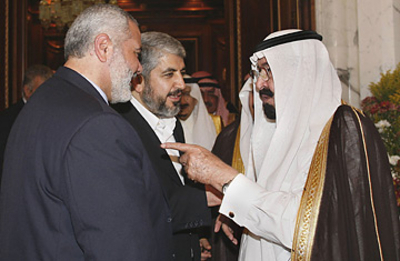 Better times: Ismail Haniyeh (left) and Khaled Meshaal (center) of Hamas in Jeddah with Saudi king Abdullah in 2007. Rising antisemitism: Especially in Europe but also in Canada and Australia, antisemitism came to the fore, mainly from Palestinians and Islamists as well as from their far-left allies. This response will, in all probability, increase immigration to the two havens of Jewish life, Israel and the United States. By contrast, Middle East Muslims kept quiet, with the exception of Turks and those Arabs living under Israeli control. Elite vs. popular responses: It's not every day that the secretary-general of the United Nations and all 28 foreign ministers of the European Union side with Israel against an Arab enemy, but that did occur. In the U.S. congress, the Senate unanimously approved and the House voted 395-8 in favor of an additional $225 million for the Iron Dome program. In contrast, among the wider public, pro-Israel sentiment declined almost everywhere (although not in the United States). How to explain this disparity? My hunch: Leaders imagine what they would do if faced with enemy rockets and tunnels, while the public focuses on photographs of dead babies in Gaza. Dead babies: Which brings us to the most complex, counterintuitive, and strange aspect of the entire conflict. Because the IDF enjoys a crushing advantage over Hamas on the battlefield, their confrontation resembled a police operation more than a war. Thus, Israelis were judged primarily by the clarity of their leaders' public statements, the judicious use of force, and the handling of evidence. Accordingly, media attention invariably drifted from the military sphere to questions of proportionality, morality, and politics. Hamas' greatest strategic weapon in its effort to damage Israel's reputation and ostracize it was neither rockets nor tunnels but wrenching photographs of dead civilians purportedly killed by the IDF. This leads to the bizarre situation in which Hamas seeks the destruction of Palestinian property, compels civilians to sustain injuries and death, inflates casualty figures, and may even intentionally attack its own territory – while the IDF takes gratuitous fatalities to spare harm to Palestinians. The Israeli government goes further, providing medical care and food and sending technicians into harm's way to make sure that Gazans continue to enjoy free electricity. Trucks with food, medicines, and other provisions going from Israel to Gaza at the Kerem Shalom crossing during the hostilities. It's a curious war in which Hamas celebrates Palestinian misery and Israel does its best to keep life normal for its enemy. Strange, indeed, but this is the nature of modern warfare, where opeds often count for more than bullets. In Clausewitzian terms, war's center of gravity has moved from the battlefield to public relations. In all, the civilized and moral forces of Israel came off well in this face-off with barbarism. But not well enough to forestall, for too long, yet another assault.